I have just come back from one of the most exciting exhibitions of Japanese art that I have ever seen ( and I have seen plenty, over the years !). The funny thing is that all the works I saw today are here in Japan only temporarilly, on loan from the Boston Museum of Fine Art in the USA. Now why, you may ask, does an American Museum have such a magnificent Japanese collection? Well, there are two reasons. First, there was Japan`s politico-economic situation in the late 19th and early 20th centuries. Newly opened to the world and engaged in an all out drive toward modernization and westernization, Japan was throwing out the old and taking on the new- with a passion. As part of this trend, there was a general disregard for many forms of traditional art- especially Buddhist Art, which the Japanese at the time did not even think of as art at all. 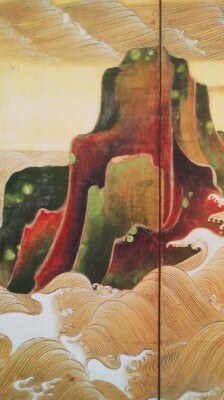 In fact, with a government policy of forcibly separating the foreign-import Buddhism from native Shinto (Shin-Butsu Bunri, 神仏分離) there were actually bands of fanatics going around the country destroying Buddhist images and structures ( think of the Cultural Revolution in China, on a modest scale). Especially if they were associated with SHUGENDO (修験道) a Shinto-Buddhist syncretism which the new regime deemed as being overly superstitious. The area which is now Tsukuba City, and the temples on Mt Tsukuba itself, were very hard hit by this violence carried out in the name of what is called HAIBUTSU KISHAKU (廃仏毀釈)- which literally means: Abolish Buddhism, Destroy the Buddha. Also in those times, many of the samurai who had lost their hereditary positions and sources of income when their class was abolished by the government, had to sell off their family heirlooms to make ends meet. Many old aristocratic families also found themselves in a similar situation in those volatile times. So in that period what you had were many neglected Buddhist treasures, which might even have under threat of destruction, while at the same time many great masterpieces of Japanese art- painted scrolls, ink paintings, swords, kimonos etc. which had been held by samurai and aristocratic familes for generations, were now suddenly up for sale. And a superb collection it did grow to be- even among Japanese specialists it is said that : You haven`t seen Japanese art until you`ve been to Boston. And now Boston has come to Japan! So do not miss this chance. The exhibition is only on until the 10th of June. I you decide to see it (and you should!) I would recommend going this Friday evening, when the museum is open later than usual- until 8 pm!. The exhibition will then move on to Nagoya, Fukuoka, and then Osaka- far away……… but not as far as Beantown! Naturally, the Boston Museum exhibition is no exception. I found it ironic indeed (and fitting), however, that the great interest in traditional Japanese art in Japan today is in some part due to the efforts of Fenolossa, Bigelow, and Okakura Tenshin, the three figures who put together the collection now being shown. Back when the Japanese themselves were neglecting or actively rejecting their own aesthetic traditions, it was these men who never stopped stressing the importance of this country`s artistic and cultural heritage. It took decades for the Japanese public in general, to finally appreciate what these men ( and others like them) had long been insisted on. Entering the first room, passing by a statue of Okakura Tenshin ( who has deep connections with Ibaraki Prefecture- in which Tsukuba is located) I encountered right off the bat what was probably the most exciting part of the exhibition for me. 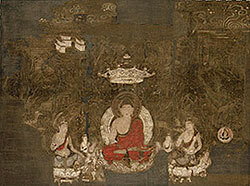 The section was called Buddhist Deities and Shinto Manifestations. The seventeen paintings and four sculptures I saw displayed there were striking to me not only in the glow of their beauty ( which gave strong proof of the high level of discernment possessed by Fenolossa, Bigelow, and Tenshin), but also in the fact that the themes of the works- the Buddhist figure: Nyoirin Kannon, Bato Kannon, Fudo Myo-o, were so familar to me……. as a resident of Tsukuba interested in local culture! 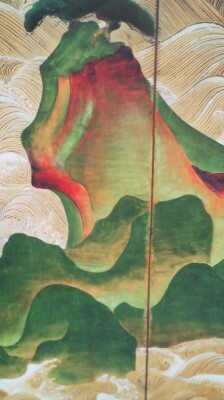 These are the main images commonly found in the temples and prayers hall- even on roadsides, in the form of stome Buddhas, of each and every one of the traditional hamlets which are now part of Tsukuba City. As I have mentioned before, a form of Syncretic Buddhism ( combining elements of Buddhism and Shinto) long thrived in the Tsukuba area. And while the famous temple complex on Mt Tsukuba itself was destroyed in the violence of HAIBUTSU KISHAKU, many images were saved by villagers in the surrounding area . When Fenolossa, Bigelow and Tenshin were travelling the country more than 100 years ago, they were able to get their hands on (and thus save) similar syncretic Buddhist works which would most probably have been lost to anti-Buddhist fanatics. One thing I immediately realized after slowly savoring this section (and having read all the explanations in English and Japanese), and something which raised concern for me, was that there was no mention at all about the threat to Buddhist art at that period, or to the fact that the Americans (with their eminent Japanese colleague) had actually saved these treasures. Later, looking through the exhibit`s catalogue and viewing a companion CD, I found proper mentioning of HAIBUTSU KISHAKU. But still I think it HAD TO be mentioned in the exhibit halls. I mean, many visitors do not buy the catalogue/dvd, and these people could not gain an understanding of the origins of the collection. I did, in fact, even overhear comments in the exhibition hall whose general gist was: Why are these works in America? How did the Boston museum get these? in which I detected a sense of resentment- as if these people might have thought that these treasures were taken away (or stolen even) during the post-war American occupation. But no, they were not. These works could actually be said to have been saved by the Boston Museum`s of Fine Art`s staff and the constant dedication of that museum to the promotion of the value of traditional Japanese art and aesthetics can be seen as actually having helped the Tokyo National Museum in Ueno become the immensely popular institution that it is today. One other thing that bothered me in this otherwise extremely satisfying (for me) section of the exhibit was the labelling of one of the paintings- one which was instantly recognizeable to me as an image of DAINICHI NYORAI, the central deity of the Shingon Sect of Buddhism ( which is the dominant sect in the Tsukuba area). With the disk of the sun behind him and his left index finger gently enwrapped in the fingers of his right hand, this image would be familiar to any older resident of Tsukuba`s traditional neighborhoods. 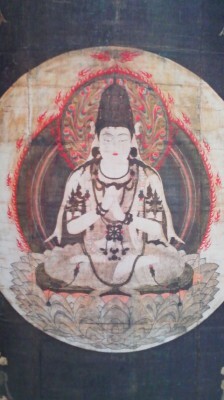 The museum had this work labelled as Ichiji-Kinrin, the Cosmic Buddha of the Golden Wheel. I asked one of the museum attendants if I could contact the curator of the exhibit about this. I told her what I thought about the labelling of the image. A bit later I was actually contacted by the museum staff and was told that Ichiji-Kinrin and Dainichi Nyorai were one and the same! Still, I thought that labelling this work with the more familiar name Dainich Nyorai would have been better ( I have subsequently carried out an independant survey and found not a single person who had ever heard of Ichiji Kinrin) for the appreciation of the general public. It would also have been interesting for the curators to have explained WHY the Dainichi Nyorai was important for those who combined elements of Buddhism and Shinto- DAINICHI means the sun. And by using a Buddhsit deity associated with the sun, a connection was immediately made with the most central of all the myriad Shinto deities- Amaterasu- the Sun Goddess. The next section displayed only two items- outstanding 12th and 13th century painted handscrolls – and they are surely one of the presents show`s highlights. 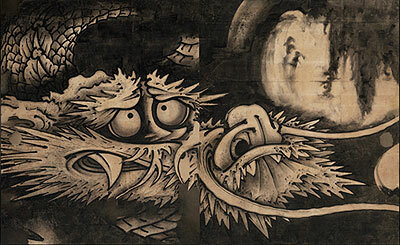 Painted scrolls were the MOVIES or CARTOONS of the ancient Japanese aristocracy. Unrolling the scroll bit by bit, a story is revealed. Unforunately, my eye-sight is not what it used to be, so it was difficult for me to focus on all the little details. It was not until I sat down with the exhibition`s catalogue that I could fully appeciate these works. The first, a set of four scrolls, humorously depicts the fantastical adventures of the Nara Period Scholar Kibi no Makibi (693-775) during his stay as an official envoy of the Japanese court in Tang China. We see how Makibi outwits his mischivious Chinese hosts (who are always trying to humiliate him). We see Makibi`s ship arriving in China. We see him greeted by officials of the Tang. We see him led to the capital. We see his escorts fallen asleep. Then, we see a red faced demom- which is in fact the ghost of another Japanese scholar who had been in the Tang- Abe no Nakamaro. This ghost procedes to help Makibi come out on top each time the Chinese try to play tricks on him. First, they prepare some difficult questions for him. 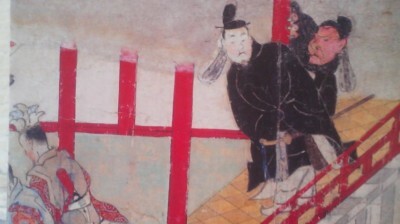 The ghost of Nakamaro, however, carries him through the air from the tower in which he is staying all the way to the chambers in which the Chinese are preparing the unanwerable questions. 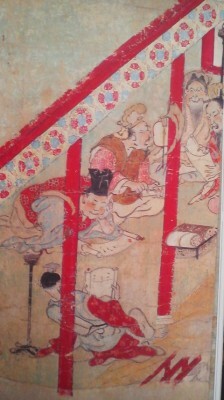 A detail from the set of 4 handscrolls entitled Minister Kibi`s Adventures in China - Here we see the Japanese envoy, Makibi, and the red faced ghost of a former envoy, Abe No Nakamaro, listening in on the Chinese officials who are planning to humiliate Mabiki by asking him impossibly difficult questions. 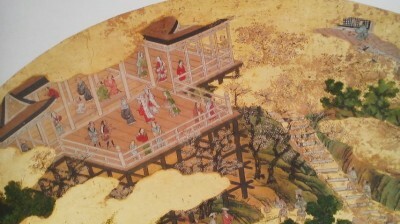 The ghost has transported Makibi from the tower in which he was staying, through the air, to these chambers. When his amazed hosts had heard his correct answers, he astounded them further by saying that any Japanese could have done so. When the Chinese Emperor heard of this, he suggested another way of getting the best of the Japanese envoy- challenging him to play a game of GO against one of China`s great GO masters. Makibi did not know how to play the game at all., but the ghost of Nakamaro taught him the ropes. Still, beating a great master required some trickery, and to achieve victory Makibi had to secretly swallow one of the go stones. 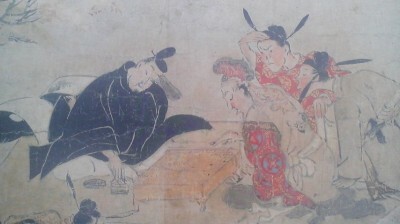 The Chinese master could not believe he had been defeated. Realizing there must have been some cheating, he counted the stones and found one missing. Makibi pleaded innonence. He was searched, but no stone was found. The go master, realizing that makibi must have swallowed the stone, ordered the Japanese to be given a laxative which would clear out his bowels. They do this. 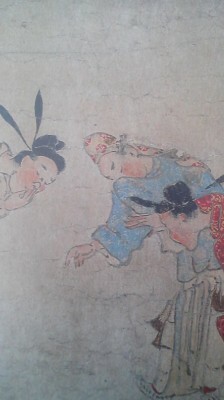 The next picture shows the Tang officials holding their noses as they pick through Makibi`s stool. But they find nothing. Makibi could magically hold the stone in! The triumphant Japanese envoy, then returned to Japan with the prizes we had recieved- among them. a go board ! I was interested to learn that this set of scrolls was acquired by the Boston much later than most of the other works exhibited- in the early 1930`s. It was discovered not by Fenolossa, but by a Japanese specialist working for the museum named Tomita Kojiro. With the American purchase and removal from the country of this treasure, the Japanese government realized that something had to be done. Soon after, a law was passed restricting the export of important cultural properties. 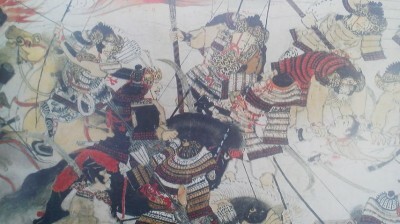 The other picture scroll, Night Attack on the Sanjo Palace, from the Illustrated Scrolls of the Events of the Heiji Era, is just as impressive in the quality of its state of preservation, and much more densely packed in its detailed battle scene depictions. The next two sections of the exhibition, Stillness and Radiance- Medieval Ink Painting and the Early Kano School, and The Blossoming of Early Modern Painting, contained works which would have been the stars of just about any other show, but with the picture scrolls coming before, and the surprisingly exciting ( and refreshing) works of Soga Shohaku coming after, I had to really exert energy after I had left the museum to try remember exactly what I had seen in between. In Stillness and Radiance, the impact of Zen was evident in the ink paintings, most of which seemed to me, undifferentiatable from Chinese ink painting. The reason for this is important for anyone interested in Japanese history and culture. In the 13th century, boatfulls of refugees from China, many of them extremly intelligent, learned, and talented, arrived in Japan in the wake of the Mongol invasion of the Middle Kingdom. In fact, the labels on at least one of the works shown in this section indicated that no one was sure if it were produced in Japan or China. At first, these ink paintings were made exclusively by Zen monks ( many of whom were probably of Chinese origin).Later, however, as Japan fell into disorder in the late 15th century, a school of painting called the Kano School began to dominate the field. The Boston Museum of Fine Arts` Collection helps us to get a sense of how Japanese ink paintings eventually evolved into the Kano School`s more colorful later style ,which involved the distinctive use of gold backgrounds. In the Blossoming of Early Modern Painting section, there were examples of works from such major schools of the Azuchi Momoyama and Edo Period- the Kano, Hasegawa, and Unkoku schools being the most outstanding. 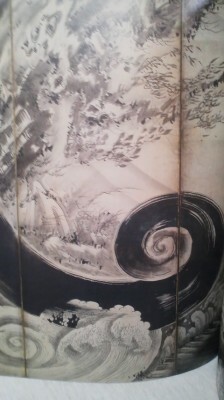 While the influence of Chinese painting remained strong in many of these older works featuring dragons, tigers, hawks, horses, and scenes of China ( probably made to cater to the tastes of ambitious warriors), the later, Edo Period works of Tawara Sotatsu depicting flowers against gold backgrounds and the surprisingly modern looking Waves at Matsushima, by Ogata Korin show a new type of distictively Japanese beauty. 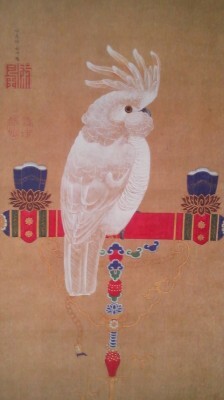 At the end of this section, leaving a strong impression was a painting of a cockatoo ( which must have been quite exotic in Edo Period Japan) by one of my favorite artist- Ito Jakuchu – who is most famous for his astoundingly beautiful depictions of chickens!